The Fall season always means the gallery world is getting back into full swing, with major highlighted shows opening in September and October. We are excited to announce our Fall 2018 issue with a cover story on Brooklyn-based, Vermont-born painter, Grace Weaver, as she is opens a major solo show, BEST LIFE, at James Cohan in NYC. We sat down with Weaver at her Brooklyn studio over the course of a few sessions leading up to the show, learning about her process and ability to tell complex daily life stories within her large-format paintings. It was our chance to see the progress of what we think is going to be an illustrious and exciting career for an emerging artist. 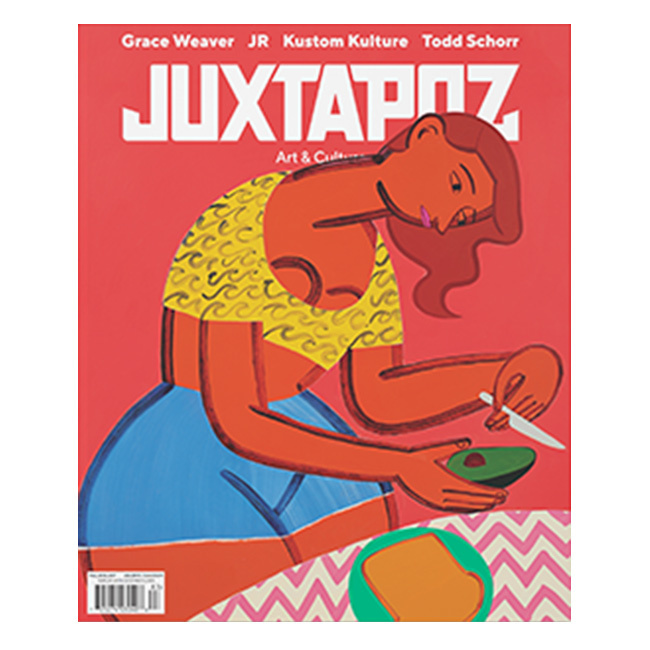 Also in the Fall 2018: We feature long format interviews with Todd Schorr, Mark Thomas Gibson, Cheyenne Julien, Super Future Kid, Martin Gordopelota, Edie Fake and look at the upcoming Auto-Didactic: The Juxtapoz School exhibition at the Peterson Automotive Museum in Los Angeles. PLUS, we talk with Ruth Asawa's daughters about their mothers legacy, JR tells us about his latest projects, follow the photography works of Carolyn Drake, look at the fresh T&C Surf works of Steve Nazar, amaze on Sebas Velasco's painterly murals, get the inside scoop on Zered Bassett's Paper Skaters and spend 9 days in Tokyo with Russ Pope.